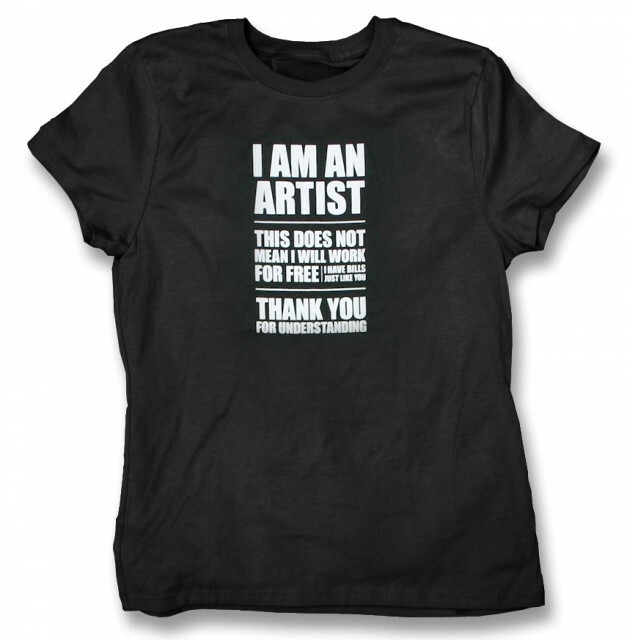 You found this I AM AN ARTIST - WILL NOT WORK FOR FREE T-Shirt on the Shirt List and it really needs a better description. Add a comment and I will get right on it. I regularly put great t-shirts on the back of my chair in my studio. It dresses up the chair a little bit and gives me a laugh every time I walk in. Another favorite is “Step away from the beads and no one will get hurt”. Being a typesetter, Bob, there is a lot more art in the type layout of that shirt than what you can do in MS Word. That’s why I have trouble when working for people who don’t understand the process and think taking pictures should only cost $20 bucks while I bring in my hundreds of dollars worth of equipment to shoot it. They just don’t see the effort and thought that went into the layout of that shirt. It’s less than five minutes worth of work in Photoshop, you pleb. If you are too lazy to read the shirt–then don’t bother. An artist designed it to get the point across and keep it simple. It’s a great shirt. 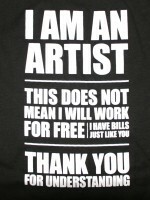 Hi, I placed this shirt on facebook because I as an artist totally agree with this message. I got a lot of responses from people, on where to buy it. So my question is, where to buy this shirt and in what sizes is it available, does it come in babysizes as well? There’s a big orange sign at the top of the page that says “Buy Now, Just click on the tee.” I’d start there. So which artist designed this shirt and were they paid to do it? It’s ironic that I can’t seem to find out. WHERE could I buy this t-shirt. I just see it but there is no link to where order one… I want it, it has such a great message!!! Just click on the tee. I really want one of these but I live in England and it seems that they are only available in the U.S. I work at a hounted house and I LOVE how they have me come in at 3:30 for makeup, but don’t start the MINIMUM WAGE timeclock until 7, which is when the haunt opens. I should be paid from the time I put my costume on, to the time I take my latex off. Moe, I fully agree with you that’s 3 1/2 hrs and the makeup people are being paid I presume. Don’t know where you work, but I have a friend who works at Hangman’s in Dallas(?) If it’s a charity fundraiser, then maybe have a little bit of leniency with them. I was doing a job for free for a neighbor who asked me for the favor for a friend of their’s. Basically retyping and recreating an existing layout of a simple brochure. I wanted it to look better, so i chose on my own to redraw their logo so it would print better. When I was finished, I turned it over to my neighbor. Done. Then the neighbor came back and said her friend needed some pictures added. OK, I had to re-align the text a bit to find the space to insert the pictures, but after a couple of hours, I did it, no real sweat. Then a few days after that, they told the neighbor that they had sent the wrong pictures and wanted two others instead, which will not fit the existing layout without substantial reworking. I’m not being paid and after a month, they are impatient. Too bad, send money or wait until I can do it when I’m not trying to earn money. If you want to get paid to be an artist then you should create art people want to buy, not just whatever floats your boat. Just saying. @Jp: True art is what you HAVE TO create cause it’s inside you and has to be expressed. Otherwise it is not art. And things go completely wrong when something is considered art just because someone is willing to pay for it. @Klara – I think many will disagree with you on this point. I believe that art is art no matter what the motivation for creating it. I agree with Klara ,it is verry difficult to make a living out of art and dont get commercialized. But I’m alway ‘s verry happy when I sell a piece .